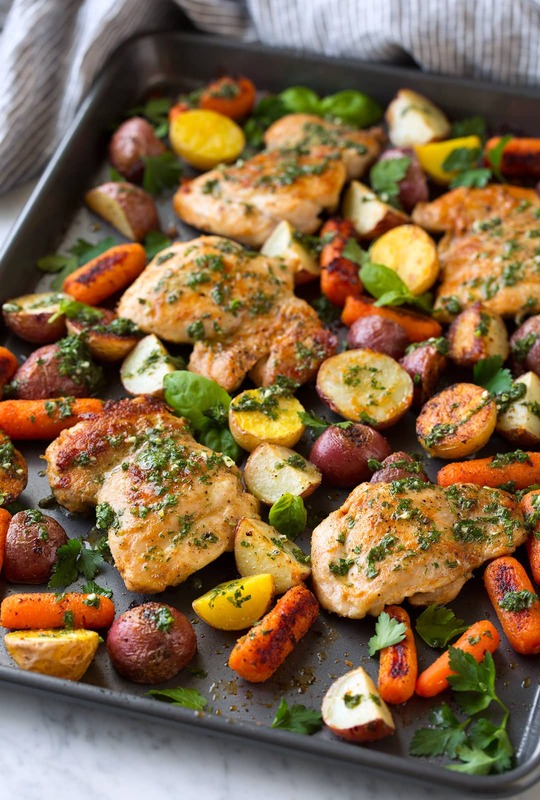 Roasted Chicken and Veggies with Garlic Herb Vinaigrette is such a tasty sheet pan recipe to add to the collection! 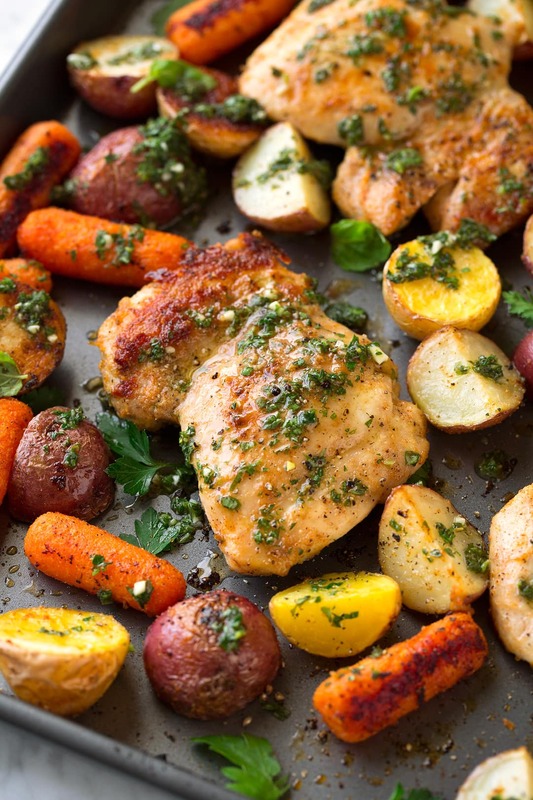 This simple chicken thigh recipe is healthy, filling and packed with flavor. What more could you ask for in a dinner? Aren’t we all on a never ending search for new chicken recipes? I cook more chicken than any other protein so I’m always trying new ways to flavor it. I used to be all about using chicken breasts but lately I’m starting to like the flavor, moisture and tenderness of thighs better. Try them in this recipe and you’ll see what I mean! 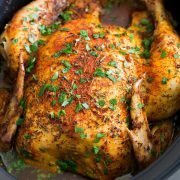 This recipe doesn’t require any browning beforehand or anything complicated just easy roasted chicken and vegetables for a satisfying meal you’ll want again and again! 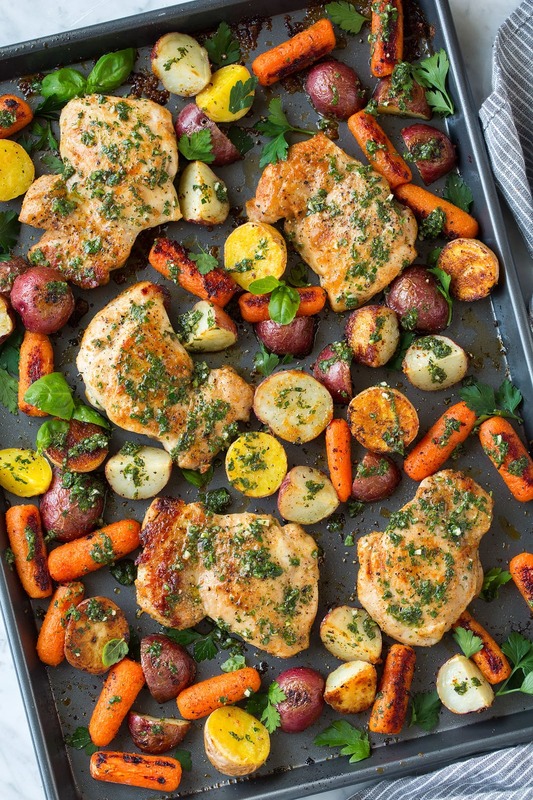 Place the chicken and veggies on a sheet pan. 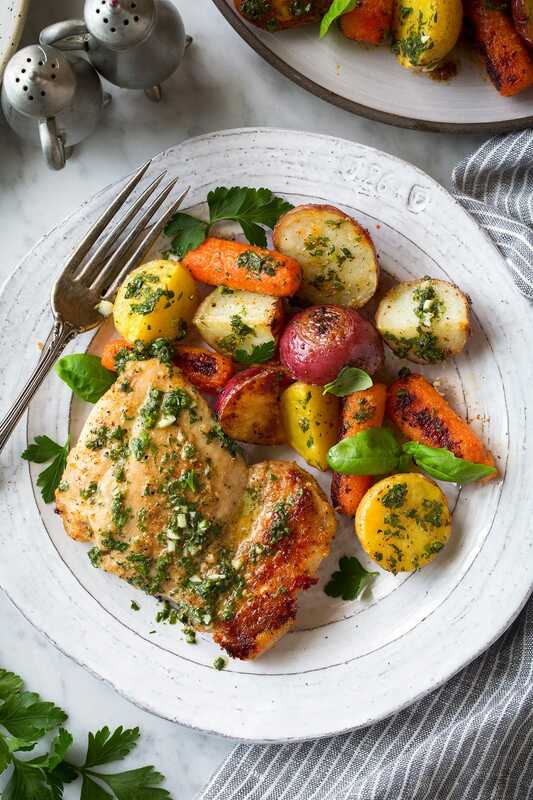 Drizzle and toss chicken and veggies with olive oil and sprinkle with some seasonings (here I just used paprika, garlic powder and onion powder, just basics because the vinaigrette is where the main, bright flavors come from). 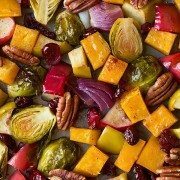 Roast mixture in a really hot preheated oven so you can get some color on everything. Also another reason the thighs are better here – they’re fattier so they’ll brown better on a dark baking sheet. And while that’s roasting you’ll make a summery vinaigrette with lots of fresh herbs. Once the chicken is done pour that bright vinaigrette over everything and you’ve got a new sheet pan dinner that’s anything but boring! For the Garlic Herb Vinaigrette you can use a variety of fresh herbs here, if you’ve got others on hand. I like this blend and it’s Italian flavors and the way they pair with the vinegar but I’m sure I’ll try others in the future as well. And maybe even use lemon for the vinegar. Cilantro + parsley + oregano is another great option. Or Marjarom + basil + thyme would also be good. And if tarragon is your thing you could even do a combo with that but tarragon is not my thing. Dill, and parsley and dry oregano would be a nice blend too – for a good Greek flavor. You get the point, it’s a versatile dressing. But please go for mostly fresh herbs and feel free to double up the vinaigrette if you want extra flavor. You are probably getting tired of this recommendation as I keep saying it, but my dark baking sheets brown things better than my uncoated light baking sheets (especially at high temps) so if you don’t have one I recommend getting one. You can buy them on Amazon. This is such an easy tasty recipe to add to the collection! And while it doesn't use chicken breasts, you'll love the rich flavor of the chicken thighs! This is healthy, it's filling and it's packed with flavor. What more could you ask for in a dinner? Preheat oven to 450 degrees. Spray a rimmed 18 by 13-inch, preferrably dark, baking sheet with non-stick cooking spray. 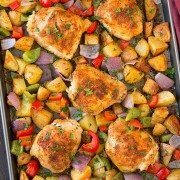 Place chicken on upper half of the baking sheet then place potatoes and carrots on lower half. Drizzle everything with olive oil and toss (keeping both chicken and veggies separate. I know they aren't in the photos, I just moved them after roasting). Season everything with onion powder, garlic powder, paprika, salt and pepper and toss veggies. Turn chicken and season opposite side with salt and pepper. Roast in preheated oven until chicken is cooked through and veggies are tender, about 25 - 28 minutes, while tossing veggies during the last 8 minutes if needed (I didn't need to toss mine but the were a shade away from being too dark on bottom so you may need to toss). Meanwhile, for the vinaigrette, in a small small mixing bowl whisk together olive oil, white wine vinegar, mustard, parsley, basil, oregano, garlic and season with salt and pepper to taste. Once chicken and veggies are done roasting pour vinaigrette over everything and spread across chicken. Serve warm.